Former President Lula da Silva, who held office from 2003 to 2010, was sentenced to 12 years in prison for charges of corruption and money laundering relating to lucrative contract deals with Petrobras, a state-owned oil company, in return for political and personal favors. His imprisonment has proven to be a polarizing force in Brazilian politics. While some view his imprisonment as an act of justice against political corruption, others maintain that Lula da Silva is innocent and that he is the victim of a political persecution aimed at preventing his reelection. Protesters gathered around the prison where Lula da Silva is jailed in the city of Curitiba. 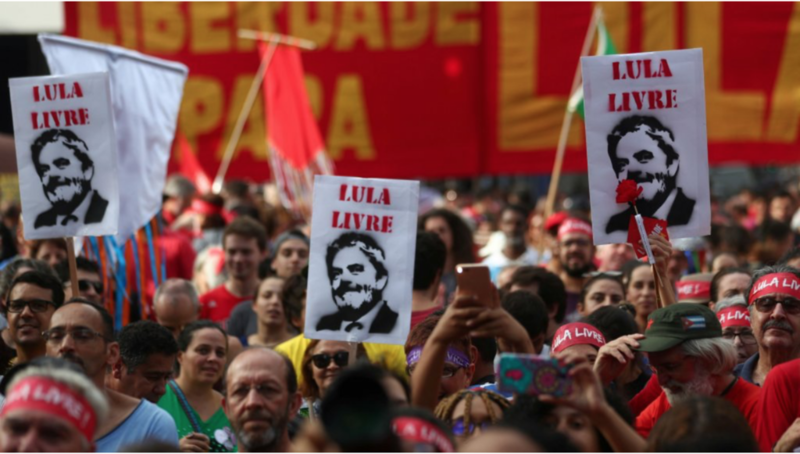 These demonstrators demanded the release of Lula from prison under the chant “Free Lula!” The protesters were also there to denounce the current president, Jair Bolsonaro. Protests have erupted throughout the country in Brasilia, São Paulo, Rio de Janeiro, and Porto Alegre, and have even spread internationally to cities throughout Latin America and Europe. Presidential candidate Fernando Haddad of the Workers’ Party also commented that the political opposition that demanded the release of Lula de Silva “wouldn’t stop until they put possibly one of the worst Brazilians in the presidency and one of the best Brazilians in prison.” Haddad lost to Bolsonaro in the 2018 Presidential elections. As of now, Lula da Silva is still scheduled to serve the remaining 11 years of his sentence in prison.